Willson, the starting catcher for the N.L. 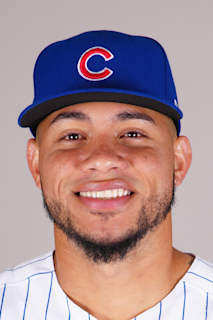 in the 2018 All-Star Game, is in his 11th season in the Cubs organization since he signed in July of 2009 ... made his major league debut with Chicago in 2016 after he was added to the 40-man roster in November of 2015 ... Has seen his catcher's ERA drop from 4.07 in 2016 to 3.91 in 2017 to 3.67 in 2018 ... Leads the majors with 18 catcher pickoffs since debuting ... no other catcher has more than nine since 2016 ... Has hit at least 10 homers in each of his three major league seasons ... His 43-career homers in his first three major league campaigns are the second-most by a catcher in franchise history, trailing only Rick Wilkins' 44 homers from 1991-93 ... Hit 33 homers in his first 175-career games, the most-ever by a Venezuelan-born major league player ... surpassed Miguel Cabrera's 32 homers in his first 175 games ... Named the 2015 Cubs Minor League Player of the Year after leading the Southern League with a .333 batting average (151-for-454) to go along with 71 runs, 34 doubles, four triples, eight home runs and 75 RBI ... Has batted .283 (537-for-1,896) in 517 minor league games across eight seasons ... Selected as the top catching prospect in baseball by MLB.com heading into the 2016 season ... also ranked by MLB.com as the 51st-best prospect in baseball ... named the second-best prospect in the Cubs system by Baseball America ... Named to the 2015 mid-season and postseason Southern League All-Star Team with Double-A Tennessee ... Selected to play in the 2015 Arizona Fall League All-Star game. Willson made his first career N.L. All-Star Team, voted as the team's starting catcher via the fan vote ... appeared in a career-high 138 games for Chicago, hitting .249 (118-for-474) with a career-best 27 doubles and five triples to go along with 10 homers and 54 RBI ... Went 1-for-2 with a solo homer in the All-Star Game on July 17 at Nationals Park, the first-ever homer by a Cubs catcher in the Mid-Summer Classic ... Led the majors with eight catcher pickoffs ... threw out 18-of-70 runners attempting to steal ... All told, made a major league-high 123 starts behind the plate and also led the majors with 1,109.2 innings behind the plate ... appeared in 133 total games at catcher ... Batted .309 (21-for-68) with an .876 OPS in 20 July contests ... combined to bat .185 (27-for-146) with a .553 OPS in 46 games over the final two months of the season ... Reached base a career-high tying four times on four occasions: April 5 at Milwaukee, May 11 vs. the White Sox and at the Pirates on May 29 and August 4 ... Delivered a career-best two triples, May 9 vs. the Marlins ... became the first Cubs catcher with two triples in a game since Steve Swisher, August 11, 1976 vs. Cincinnati ... also recorded a double ... Recorded his fourth career multi-homer game and belted his second career grand slam, May 11 vs. the White Sox ... finished 4-for-5 with two doubles, two homers and a career-high seven RBI. ..Became the fifth Cubs catcher since the RBI became an official stat in 1920 with at least seven RBI in a game, joining Ed Bailey (8 RBI, 7/22/65 vs. PHI), George Mitterwald (8 RBI, 4/17/74 vs. PIT), Barry Foote (8 RBI, 4/22/80 vs. STL) and Geovany Soto (7 RBI, 8/26/08 at PIT) ... Collected 26 total bases in a three-game stretch, May 9-12, going 10-for-15 with three doubles, two triples, 11 RBI and five runs scored ... became the first Cub since at least 1913 with seven extra-base hits in a two-game span (May 9-11) ... His three triples in the month of May were tied with Trevor Story for the most in the N.L ... Hit the game-winning homer vs. the Tigers on July 4 with a sixth inning solo blast ... added insurance by doubling in two more runs in the seventh inning in an eventual 5-2 victory ... Set a career-high with four-straight multi-hit games from July 1-6 ... went 9-for-15 with two doubles, a triple, a homer, four RBI and three runs scored. In his first full season with the Cubs, Willson ranked second among all N.L. backstops with 21 homers, 74 RBI and 45 walks ... batted .276 (104-for-377) and recorded an .855 OPS... Was slotted in the cleanup spot for the first time on June 5 ... in 44 games hitting in a cleanup role, batted .307 (47-for-153) with seven doubles, 13 homers, 39 RBI and 25 walks ... posted a 1.012 OPS when batting fourth... Ranked fourth in the National League, throwing out 20 would-be base-stealers ... his six catcher pickoffs were tied for the major league lead with Milwaukee's Manny Piña... Twelve of his 21 homers came with runners on base, tied for the second-most on the Cubs... Became only the second Cubs catcher in the last 20 seasons to reach 20 homers, joining Geovany Soto (23 in 2008)... Recorded three multi-homer efforts: May 12 at St. Louis, August 3 vs. Arizona and August 6 vs. Washington... Belted a ninth inning, game-tying three-run homer Opening Night, April 2, in St. Louis … marked just the fifth time a Cub under the age of 25 homered in a season opener... At 24 years and 324 days old on April 2, joins Corey Patterson in both 2003 and 2004, Matt Murton in 2006 and Anthony Rizzo in 2013... Recorded a career-high 10-game hitting streak that dated back to Sept. 28, 2016 and ran through April 13 … hit .361 (13-for-36) with a 1.006 OPS during the run... April 16 vs. Pittsburgh, recorded a caught stealing and a pickoff in the seventh inning … became the first Cubs backstop to record a caught stealing and a catcher pickoff in the same frame since Jody Davis, May 14, 1986 against the Giants (second inning)... Belted his first career grand slam, April 22 in Cincinnati … was the first regular-season slam by a Cubs catcher since Miguel Montero, September 6, 2015, vs. Arizona... Hit a solo homer off Clayton Kershaw, May 28, to lead off the second - was a 12-pitch at-bat, the latest in an at-bat a Cub went deep since Mike Fontenot in 2009 off Arizona's Dan Haren... Belted a lead-off homer, June 26 at Washington off Gio Gonzalez, in his first career game at the top of the order ... became the first catcher in franchise history to lead off a game with a homer ... was the first Cubs catcher to even bat leadoff since Michael Barrett, June 20, 2004 ... thanks to Ed Hartig... Enjoyed a torrid July, hitting .321 (27-for-84) with four doubles, seven homers, 19 RBI, 11 walks, a .400 OBP, and .619 slugging mark, good for a 1.019 OPS ... became the first Cubs catcher with at least seven homers and 19 RBI in a month since Rick Wilkins (8 HR, 20 RBI) in June of 1993... Recorded his first career four-hit game, July 16 at Baltimore... Drove in a career-high six RBI, August 3 vs. Arizona ... was 3-for-5 with two homers and two runs scored... Was named N.L. Player of the Week for July 31-August 6 after batting .455 (10-for-22) with a league leading five homers, 13 RBI and 1.660 OPS in six games, including a pair of multi-homer efforts vs. Arizona and Washington... Batted .331 (50-for-151) with nine doubles, 16 homers, 45 RBI, 17 walks and 25 runs scored in 42 games from June 16-August 6 ... ranked second in the N.L. in both homers and RBI in that span... Suffered a right hamstring strain while running to first base, August 9 in San Francisco ... landed on the 10-day DL, August 11 (retro to August 10) ... played in two postseason games with Single-A Myrtle Beach on a rehab assignment, going 1-for-4 with a pair of walks... Went 4-for-8 with three RBI and six walks (.714 OBP) in his first four starts off the disabled list, September 12-16 ... ranked fourth in the N.L. with a .460 on-base percentage after returning on September 10 (min. 50 plate appearances)... Went 7-for-32 (.219) with two homers, two RBI, five runs and six walks in 10 postseason games ... led the team in runs scored and walks, while tying for the team lead in homers. Willson was promoted to the Cubs, June 17, and made an instant impact both offensively and defensively ... batted .282 (71-for-252) with 14 doubles, 12 homers, 35 RBI and 26 walks, while catching 12 runners stealing and recording four catcher pickoffs ... His 12 homers were the third-most by a Cubs rookie catcher in franchise history, trailing only Geovany Soto (23, 2008) and Randy Hundley (19, 1966) ... Played three positions, spending time at catcher (57 games), left field (24 games) and first base (three games) ... His 12 runners caught stealing ranked tied for second-most among rookie catchers, while his four pickoffs tied for second among all catchers ... Beginning June 19, he ranked among N.L. rookies in homers (4th, 12), RBI (t-4th, 35), doubles (5th, 14) and walks (t-5th, 26) ... Batted .311 (23-for-74) against lefties and .270 (48-for-178) off righties ... however, had nearly identical OBPs against lefties (.354) and righties (.358) ... Hit at a .256 clip (10-for-39) in 17 postseason games, adding one homer and five RBI ... connected on an RBI double off Corey Kluber in Game Seven of the World Series, extending the Cubs lead to 3-1 ... homered off Clayton Kershaw in Game Six of the NLCS ... Batted .452 (14-for-31) with three doubles and three homers in his last 11 games beginning September 16 ... Connected on eight of his 12 home runs at Wrigley Field ... batted .301 (40-for-133) with nine doubles and 23 RBI in 42 home contests ... Hit a pinch-hit two-run homer on the first pitch of his first major league plate appearance, June 19 vs. Pittsburgh … was the first homer by a Cubs player in their first plate appearance since Jorge Soler in 2014 ... was the first Cubs player to homer in his first major league plate appearance while in a game at Wrigley Field since Cuno Barragan, September 1, 1961 vs. the Giants (Elias). w Became the first MLB player with a homer on his first career pitch seen since Minnesota's Eddie Rosario, May 6, 2015 against the A's … first N.L. player to do so since Pittsburgh's Starling Marte, July 26, 2012 against the Astros … first Cubs player to do so since Jim Bullinger, June 8, 1992 at the Cardinals (thanks STATS Inc.) ... Reached safely in his first 13 major league games with a plate appearance, including hits in his first seven contests ... added a career-high 18-game on-base streak, July 3-25 ... was the longest streak by a Cubs rookie since Kosuke Fukudome reached in 19-straight contests, June 7-30, 2008 ... June 24 in Miami, hit a two-run homer in the first and broke a 4-4 tie with a run-scoring single in the seventh, helping the Cubs to a 5-4 victory ... Was recalled from Triple-A Iowa, June 17, and made his major league debut that day as a defensive replacement ... Batted .353 (72-for-204) with 16 doubles, three triples, nine homers and 43 RBI in 55 games to begin the season with Iowa … joined the Cubs riding a 20-game hitting streak in Iowa, during which he batted .383 (31-for-81). Willson Contreras enjoyed a breakout season with Double-A Tennessee, leading the Southern League in batting average (.333/151-for-454) en route to earning Cubs Minor League Player of the Year honors. Became the first Tennessee player to win the league batting title since Joe Gate in 1978. Set career-highs in games played (126), at-bats, runs scored (71), hits (151), doubles (34), RBI (75), walks (57) and average. Ranked second in the league in doubles, RBI and on-base percentage (.413) while his .478 slugging percentage ranked third and his 217 total bases were fifth. Named to the Southern League mid-season and postseason All-Star teams … posted nearly identical batting averages in both halves, batting .332 (69- for-208) before the break and .333 (82-for-246) after the break. Hit .371 (33-for-89) against left-handed pitching and posted a .323 mark (118-for-365) against righthanders. Enjoyed a season-high 14-game hitting streak, July 28-August 10, in which he batted .519 (28-for-54) and earned Player of the Week honors for July 27-August 2. Recorded a .987 fielding percentage (8 E/600 TC) and threw out 27-of-97 (27.8 percent) baserunners attempting to steal. Collected a season-high four RBI thanks to a sixth-inning grand slam, July 28 at Montgomery. Batted .333 (40-for-120) with nine doubles and 26 RBI with runners in scoring position and two outs. Hit .283 (15-for-53) with five doubles, three homers and eight RBI in 14 games with Mesa in the Arizona Fall League ... recorded a .908 OPS ... named to the Arizona Fall League All-Star Game. Appeared in 80 games with Single-A Daytona, batting .242 (68-for-281) with 40 runs scored, 14 doubles, two triples, five home runs and 37 RBI ... Drew 28 free passes while striking out 66 times … went a perfect 5-for- 5 in stolen base attempts … Recorded four-straight multi-hit efforts, May 19-24, going 9-for-14 with four doubles … Homered and drove in a season-high three RBI in back-to-back games, August 16-17 at Tampa … Hit .370 (20-for-54) with five doubles and eight RBI in 16 May games after posting a .159 mark (7-for-44) in 12 April affairs … Posted a season-best 12-game hitting streak from August 16-29, batting .357 (15-for-42) with 11 runs scored, three home runs and 10 RBI during the stretch … Went 31-for-89 (.348) with a combined 24 RBI in the seventh, eighth and ninth innings of a game … Batted .455 (5-for-11) with 11 RBI with the bases loaded … Played 26 games with Aragua of the Venezuelan Winter League, batting .273 (18-for-66) with five home runs and 17 RBI. Spent the entire season with Single-A Kane County, batting .248 (77-for- 310) with 46 runs scored, 11 doubles, a career-best five triples, 11 home runs and 46 RBI ... Collected a season-high four hits July 25 at Beloit, going 4-for-4 with a homer and three RBI ... Drove in a season-best three on four occasions - April 18 vs. Quad Cities, May 4 vs. Dayton, June 11 vs. Burlington and July 25 at Beloit ... Logged a .329 batting average (25-for-76) against southpaws compared to a .222 mark (52-for-234) against righties ... Began the season hot, batting .326 (15-for-46) with three home runs and 10 RBI in 14 April games ... Went 18-for-57 (.316) with seven walks and 13 RBI with runners on base and two outs ... Played seven games with Aragua of the Venezuelan Winter League, batting .333 (5-for-15) with three runs scored and one double. Posted a .273 batting average (68-for-249) with 32 runs scored, 10 doubles, three home runs and 39 RBI in 64 games with Single-A Boise ... Made the transition from an infielder to catcher, appearing in 39 games behind the plate ... Registered a season-high four hits, June 28 vs. Spokane, going 4-for-5 with a double and three RBI ... Went 2-for-4 with a home run and season-best four RBI, August 12 vs. Salem-Keizer ... Owned a .319 batting average (22-for-69) against southpaws … hit .256 (46-for-180) against righties ... Enjoyed a big August, posting a .333 average (29-for-87) with six doubles and 16 RBI in 21 games ... Was 20-for-53 (.377) when leading off an inning … went 13-for-34 (.382) with 19 RBI with runners in scoring position and two outs. In his first professional season outside of Summer League ball, Willson batted .261 (58-for-222) with 31 runs scored, five doubles, four triples, two home runs and 27 RBI in 60 games with Single-A Boise ... Registered multi-hit efforts in four-straight games, August 10-14, going 9-for-16 during the stretch ... Wore out southpaws to the tune of a .417 average (20-for-48) … batted just .218 (38-for-174) against righties. Appeared in 17 games with the Cubs Dominican Summer League team, batting .313 (20-for-64) with two doubles and nine RBI ... Recorded multi-hit efforts in five of the 19 games, including back-toback, three-hit games August 12-13. In his first season with the Cubs organization, Willson batted .205 (23-for- 112) with 13 runs scored, five doubles, two triples, one home run and six RBI in 29 games with the Cubs Dominican Summer League team ... Signed as a non-drafted free agent July 2, 2009. September 18, 2017 Chicago Cubs activated C Willson Contreras. September 17, 2017 C Willson Contreras roster status changed by Chicago Cubs. September 10, 2017 Chicago Cubs activated C Willson Contreras from the 10-day disabled list. September 7, 2017 Chicago Cubs sent C Willson Contreras on a rehab assignment to Myrtle Beach Pelicans. August 11, 2017 Chicago Cubs placed C Willson Contreras on the 10-day disabled list retroactive to August 10, 2017. Right hamstring strain. June 17, 2016 Chicago Cubs recalled C Willson Contreras from Iowa Cubs. March 18, 2016 Chicago Cubs optioned C Willson Contreras to Iowa Cubs. November 20, 2015 Chicago Cubs selected the contract of Willson Contreras from Tennessee Smokies. April 6, 2015 C Willson Contreras assigned to Tennessee Smokies from Myrtle Beach Pelicans. March 11, 2015 C Willson Contreras assigned to Chicago Cubs. March 30, 2014 Willson Contreras assigned to Daytona Cubs from Kane County Cougars. March 24, 2014 C Willson Contreras assigned to Chicago Cubs. October 13, 2013 C Willson Contreras assigned to Tigres de Aragua. June 8, 2013 Kane County Cougars activated C Willson Contreras from the temporarily inactive list. June 5, 2013 Kane County Cougars placed C Willson Contreras on the temporarily inactive list. April 1, 2013 C Willson Contreras assigned to Kane County Cougars from Boise Hawks. March 3, 2013 3B Willson Contreras assigned to Chicago Cubs. April 2, 2012 3B Willson Contreras assigned to Chicago Cubs. June 14, 2011 Willson Contreras assigned to Boise Hawks from DSL Cubs2. May 25, 2011 3B Willson Contreras roster status changed by DSL Cubs2. July 31, 2010 3B Willson Contreras assigned to DSL Cubs2. October 2, 2009 DSL Cubs2 placed 3B Willson Contreras on the restricted list. July 15, 2009 DSL Cubs2 signed 3B Willson Contreras.